Tagbilaran, specifically the district of Bool, witnessed the forging of the first international treaty of peace and friendship between two nations of different race and creed. 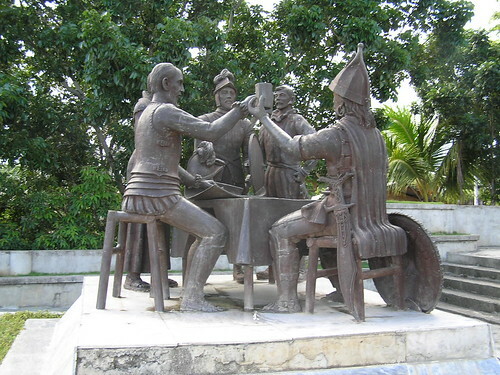 On that fateful day of March 16, 1565, Captain General Miguel Lopez de Legaspi of the Spanish expedition and Datu Sikatuna, a native chieftain of Bohol, sealed their friendship in a native ritual, the Blood Compact. As is the native custom at that time, the two sealed their friendship through the shedding of blood wherein both draw two to three drops of blood from their arms, mix the blood with the wine and then equally drank from the cup. Other historians say that the blood-wine mixture was divided equally between the two and then they both drank the contents up to the last drop. On November 21, 1564, Legaspi (the surrogate of the crown of Spain) sailed from Navidad, Mexico with the purpose of searching for gold, silver and spices, and to Christianize the natives of the islands that they will come in contact with. Because of the later reason, Legaspi was accompanied by six Augustinian missionaries in addition to Fr. Andres de Urdaneta who served as navigator and spiritual adviser. This expedition was the 5th that the Spanish crown had sent to the archipelago after the expedition of Magellan. Spain sent an expedition led by Loaisa in 1525, Saavedra in 1527, Villalobos in 1542 and finally, Legaspi in 1565. Of the five, nobody gave a name to these scattered islands except for Villalobos who called them the “Western Islands” which eventually became known as the Visayan Islands. Legaspi and his fleet of four ships arrived in Cebu on February 13, 1565 but were not able to land due to the hostility of the natives caused by the abuses of Magellan’s men when they raped the 50 virgins of Cebu. Instead he explored the island of Samar, Leyte, Limasawa, and Dapitan. He set sail for Mindanao but was waylaid to Bohol due to unfavourable weather. He dropped anchor at a village situated at the south-eastern part now called Jagna. The natives were unfriendly. A Muslim interpreter from Borneo, who is part of his fleet, related how the natives suffered from some Portuguese men who posed as Spaniards, pretended to be friendly but eventually attacked and robbed them and plundered other villages nearby. Legaspi’s plea of mercy for him and his men fell on deaf ears. The natives were angry and drove them back. Undaunted, they set sail again and sought other villages where the people were more friendly. In a village of Bool, three kilometres from Tagbilaran, Legaspi dropped anchor. He went ashore together with the Muslim interpreter and some of his men and approached Datu Sikatuna in a pleasing manner that impressed the local chieftain. With Legaspi’s overtures, tact and diplomacy, Sikatuna was sold to his visitor’s ideas and became friends. Thus they sealed their friendship with a blood compact. Historians haggle over when and where the “Blood Compact” was held and whether it was really the first treaty of friendship between Filipinos and the Spaniards. Some historians believe that the blood compact took place in 1521 at Limasawa Island, an island south of Leyte where the first Catholic Mass on Philippine soil was held. The ritual was made between the ruler of the island, Rajah Kolambu and Magellan together with Rajah Siagu of Butuan, a brother of Rajah Kolambu who was there on a visit. How, when and where the blood compact was held does not matter since all Boholanos still consider the event as very special and commemorate it with a yearly festival called “Sandugo”, meaning, “Of one blood”. The affair has become a month-long festival that is to culminate supposedly every 22 of July to coincide with the “Bohol Day” celebrations, yet extends even up to late August. The Blood Compact Site was eventually erected at the district of Bool as a visual reminder of this historic event. The Blood Compact is one of the most important historical events in the annals of Philippine History, not only of Tagbilaran City and the whole Bohol province. The event was even immortalized in canvass by the famous Filipino painter Juan Luna and his work was considered as one of his masterpieces. To further perpetuate the memory and spirit of the first treaty of peace and friendship, and of Datu Sikatuna himself, the late President Elpidio Quirino established the “Order of Sikatuna”, a presidential award and decoration conferred upon visiting dignitaries.